As the name suggests, a wall fountain is an architectural feature that’s mounted on a wall where it moves water either by jetting it out or cascading it. In the past 15 years or so, these fixtures have risen in popularity for both commercial and residential use. Awareness about its many benefits has started circulating and people have started to realize the legitimate value that wall fountains offer. Aside from the obvious aesthetic benefits of fountains, studies have also hinted at various benefits that fountains bring in terms of health and well-being. Businesses have also cited the positive effects of having a water feature in the workplace. Perhaps the most surprising part of a wall fountain’s value proposition is the fact that it’s not nearly as expensive as most people would assume. It has Calming Effects–Human civilizations have always risen near lakes, streams and rivers. Water is vital to our everyday survival and our brains have been trained through tens of thousands of years to recognize its sound as a positive one. The sound of gently rumbling water evokes feelings of tranquility; security and calm, allowing us reach higher levels of relaxation. Studies have shown that relaxation reduces stress — and lower stress levels are good for your health. Your immune system tends to stay stronger, allowing you to ward off many diseases. Less stress has also been shown to promote faster healing, allowing patients with wounds and fractures to recover in less time. It Helps Treat Insomnia – People afflicted with heavy and chronic insomnia may find relief with the help of an indoor wall fountain. The relaxing, non-stop sound of softly falling water has been shown to help patients drift off and stay asleep for long stretches. For other patients, looking at how water falls in the backdrop of a well-decorated and arranged room acts like a visual lullabye that sends them off to dreamland. It Gives a Home or Office a Classy Appeal–Fountains used to be exclusive to upscale properties such as hotels, mansions and government buildings. These days, the technology behind them has become less and less expensive, allowing anyone with a decent income to eventually get one. The aura of class and prosperity that a fountain gives a home or building, however, hasn’t changed at all. 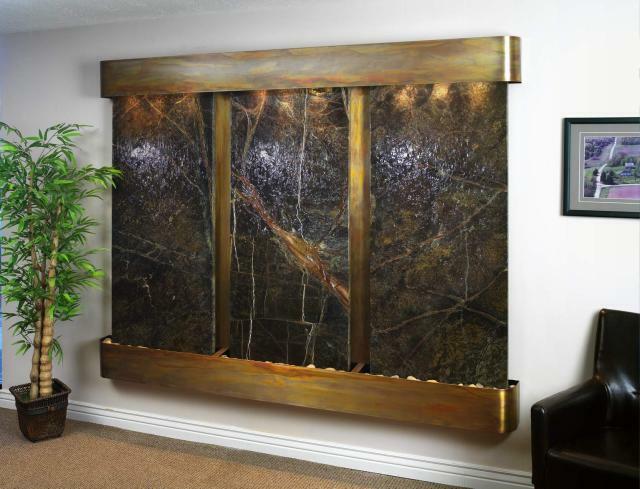 If you want to add an aesthetic piece that makes a lasting impression on people without breaking the bank, an indoor fountain mounted on your wall may just be the thing for you. It Impresses Customers – Here’s a little tip that might help you increase sales if you own a business: a relaxed and impressed person is a lot easier to sell to than a person who walks in with a regular mindset. A fountain in your commercial space can create that instant impression of prosperity. It sends the implicit message that your business is doing well and that they can rely on you because you’re a winner. The sight and sound of water also puts prospective customers at ease, making them more receptive to your sales pitch. It’s a Good Humidifier – Falling water humidifies the air during cold, dry months. This reduces the buildup of pollen and dust in the air which might trigger allergies in some people. You may also notice less static when you come in contact with metals and you’ll definitely breathe easier in the morning after a night’s sleep with the heater on. It Promotes Good Energy Flow–For believers of Feng Shui (Chinese geomancy), water features help bring balance and harmony to the flow of energy within a structure. People who believe in this ancient art should definitely consider the addition of a fountain to attract good fortune. If you’re not quite into Feng Shui, you may still want a fountain in your home or workplace for reasons based on science. Cascading water is known to release negative ions. These ions help improve energy, lower stress levels and improve your overall mood. Having a fountain may not just be good for your state of mind – it may also have positive effects down to the molecular level on human health. Overall, a wall fountain is a worthwhile investment that few people have ever come to regret. If you have the space for it and you’re ready to benefit from everything it brings to the table, start selecting a style that’s perfect for your property.